Wonderful, antique, Edwardian Era, platinum and approx. 1 carat of G color diamonds brooch. This elegant pin measures 2 1/8" x 7/8". It is in excellent pre-owned condition. Weight is 5.87 grams. 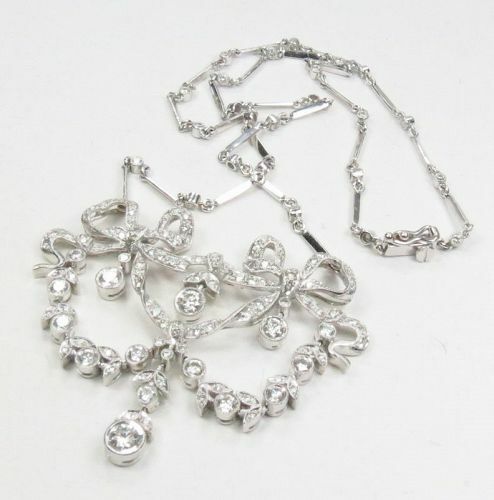 Gorgeous, antique, 18k white gold and diamond two bow necklace. This wonderful piece consists of approx. 3.8 carats of H color SI clarity diamonds. The chain with 22 diamonds is 15.5" long, pendant with dangling diamonds measures 2" x 1 5/8". Necklace is in excellent pre-owned condition. Weight is 19 grams. Gold is marked 18k. Spectacular, platinum and approx. 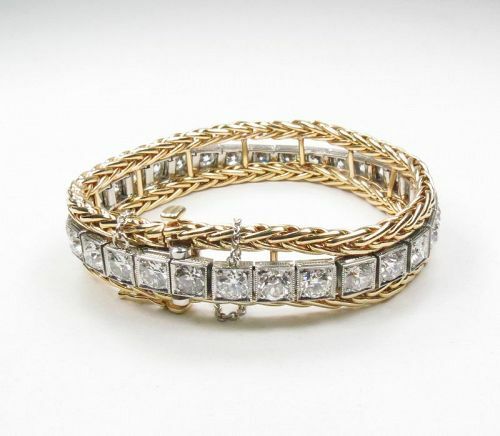 16ctw H color VSI1-2 clarity diamonds tennis bracelet, incorporated in 14k yellow gold jacket. This extraordinary bracelet is 7" long x 1/2" wide. It is in excellent pre-owned condition. Weight is 61.11 grams. 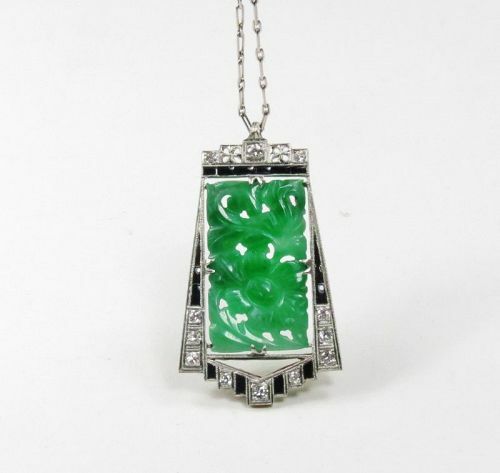 Amazing, antique, Art Deco Era, platinum, carved natural jade, diamond, and black onyx or enamel necklace. The chain is 15 1/2" long, pendant with jade and old cut diamonds measures 1 1/2" x 1". This stunning necklace consists of approx. 0.40ctw of H color diamonds. It is hallmarked Plat. 5614-3. Condition is excellent. Weight is 9.71 grams. 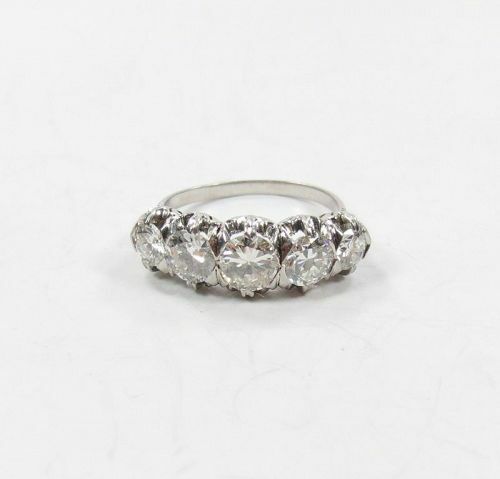 Dazzling, 950 Platinum and 3.5ctw diamond band ring. This wonderful, size 4.5 ring is 9mm wide, it consists of 1.25ctw round cut and 2.25ctw baguette cut diamonds; H-I color and SI1 clarity. Ring is in excellent pre-owned condition. Weight is 6.2 grams. 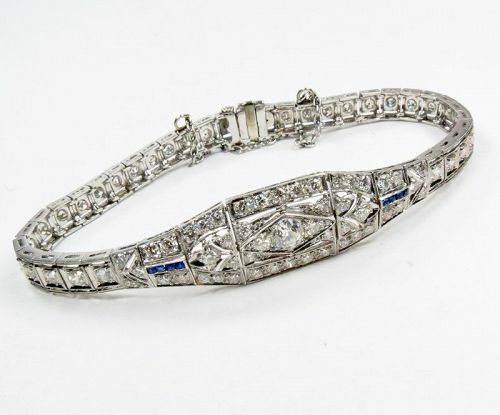 Stunning, Art Deco, platinum, diamond and sapphire bracelet. This gorgeous bracelet measures 7" long x 1/2" wide, it consists approx. 3.5ctw of H-I color SI1 clarity diamonds and 0.08ctw of sapphires. The center diamond weights about 0.40ctw. Bracelet is in excellent pre-owned condition. Weight is 20.5 grams. GIA certify, natural no heat blue sapphire diamond platinum ring. 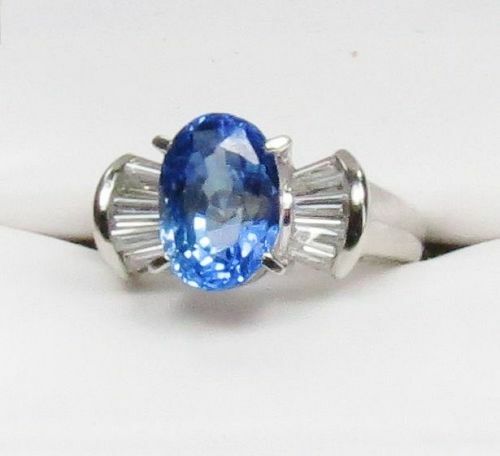 Unheated, natural 3.87ctw blue sapphire diamond ring, accented with approx. 0.55 carats of F color tapered baguettes diamonds, mounted in platinum. Top of this 5.75 size ring measures 16mm x 10mm. Ring is in excellent pre-owned condition. It comes with GIA Certificate. Weight is 8.5 grams. Vintage pair of dangle earrings composed of platinum, diamonds, emeralds, rubies and sapphires . The earrings are for pierced ears, measuring about 2 1/2" long x 5/8" wide. Earrings consist of approx. 1.6ctw of diamonds, 1.7ctw of emeralds, 1.2ctw of rubies and 0.16ctw of sapphires. Earrings are in very good condition. Weight is 21.8 grams. 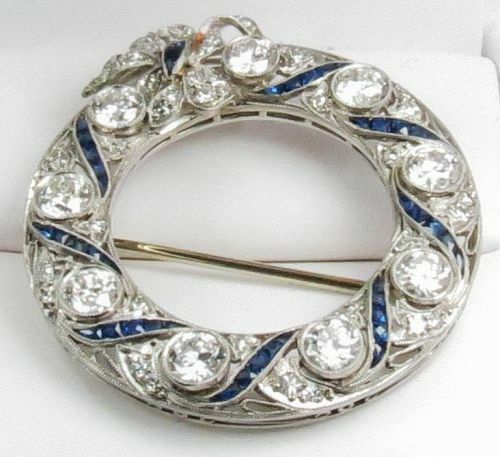 Exquisite, Art Deco, platinum, diamond and sapphire brooch with original box. 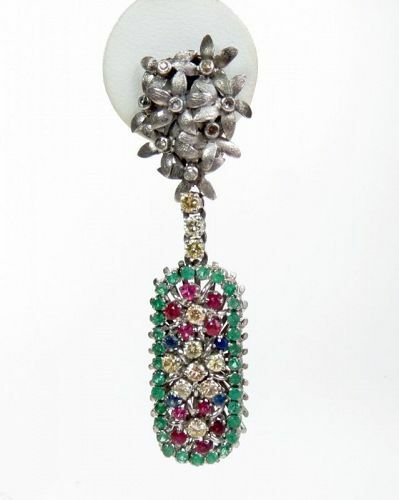 This gorgeous brooch consisting of approx 4.5ctw of G-I color VVSI diamonds, measures 1 3/8" in diameter. It is in excellent pre-owned condition. Weight is 10.7 grams. 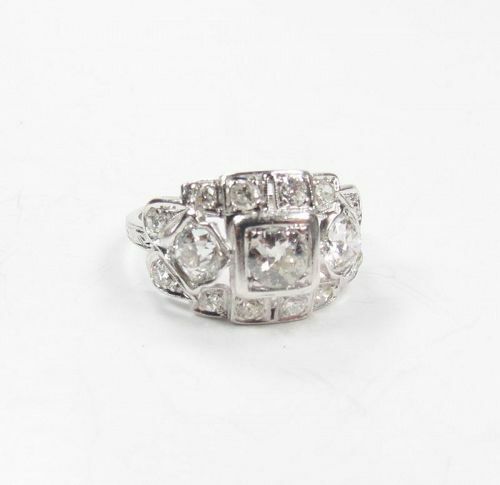 Antique, Art Deco Era, engagement ring, composed of platinum and 1.5ctw H color VSI clarity diamonds. Top of this 6 size ring measures 3/4" x 1/2". The center diamond measures 5mm x 4mm, little over 0.50ctw. Condition of this antique ring is very good. Ring is hallmarked 10% IRID PLAT. Weight is 4.5 grams. Platinum, 4.2ctw natural no heat sapphire, 2.5ctw diamond ring. Cert. A magnificent, certified, platinum, 4.266ctw natural no heat sapphire and 2.5ctw H color diamond ring. 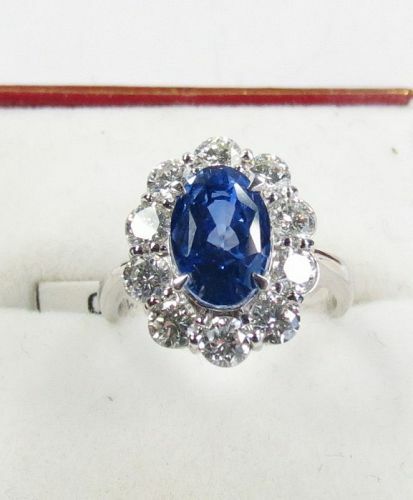 Top of the 6.5 size ring, measures 17mm x 13mm, natural, transparent blue sapphire is; 9.93mm x 6.81mm x 6.92mm. Ring is in excellent pre-owned condition. Weight is 8.4 grams. Ring comes with Gem Identification Report. 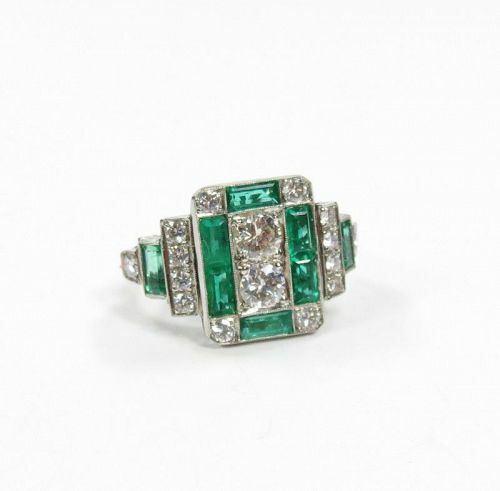 An Amazing, Art Deco style ring composed of platinum, diamonds and natural emeralds. Top of this size 6.75 ring measures 3/4" x 5/8". Ring consists of approx. 1ctw of H-I, color, VSI clarity diamonds and approx. 1.20ctw of natural emeralds. Ring is in excellent pre-owned condition. Weight is 7.16 grams. 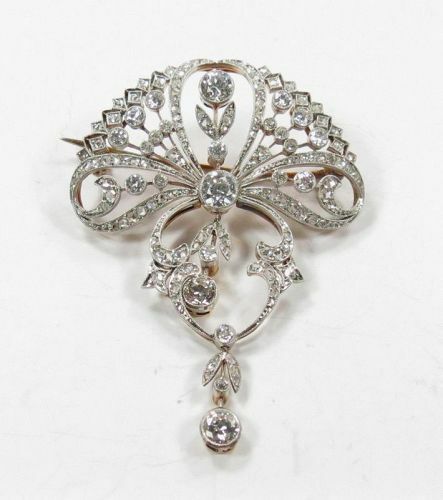 Gorgeous, antique, Edwardian Era brooch, composed of platinum, 18k yellow gold and over 3ctw of H color VSI clarity diamonds. This magnificent brooch (which could be converted to pendant), measures 2 1/4" x 1 5/8". Brooch is in excellent condition. Weight is 13 grams. Beautiful antique ring, composed of platinum and 5 H-I color, VSI clarity diamonds weighting approx. 2.25ctw. Top of this 7.5 size ring is 8mm wide. 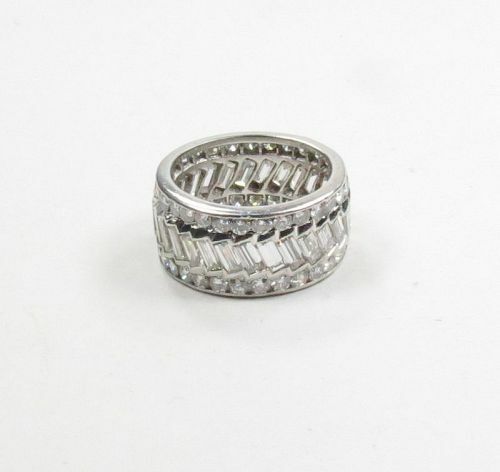 This amazing ring is in excellent pre-owned condition. Weight is 5.32 grams. 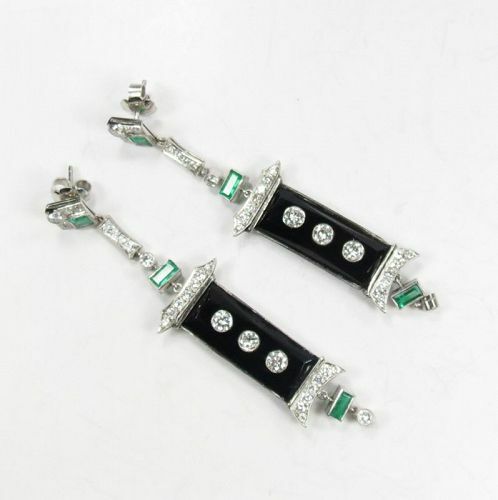 Stunning pair of estate dangle earrings, composed of platinum, 2.2ctw H color VSI clarity diamonds, natural emeralds and onyx. These gorgeous earrings are for pierced ears; measuring 2 7/8" long x 1/2" wide. Earrings are in excellent pre-owned condition. Weight is 15.5 grams. 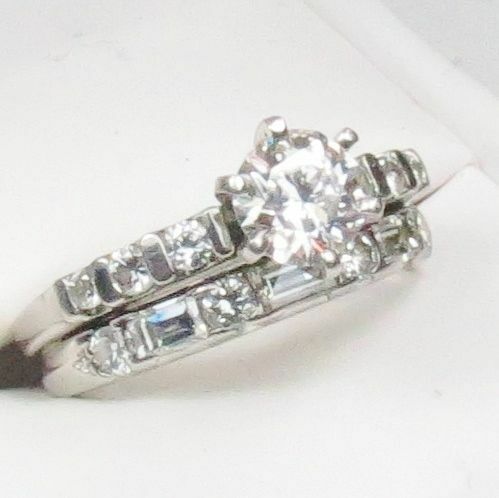 Gorgeous, Art Deco, engagement ring, composed of platinum, approx. 1ctw natural emerald and approx. 0.45ctw of sparkly H color diamonds. Top of this amazing, size 5.5 ring measures 15mm x 12mm. Ring is in very good pre-owned condition. Color of emerald is slightly darker then pictured. Ring weights 5.76 grams. Gorgeous, antique, platinum, cultured pearls and approx. 3.5ctw H color VSI clarity diamond bracelet. It is 6.5" long x 1 3/8" wide. Bracelet is in excellent pre-owned condition. The weight is 50.8 grams. We do have extra pearls for extension.